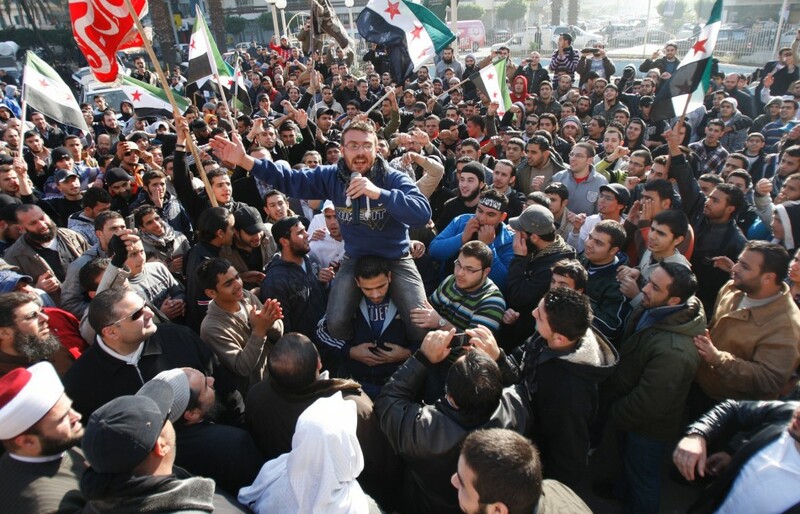 In the largest protests Syria has seen in months, hundreds of thousands of people took to the streets Friday in a display of defiance to show an Arab League observer mission the strength of the opposition movement. Despite the monitors’ presence, forces loyal to President Bashar Assad still killed at least 22 people. Thousands of Hungarians took to the streets yesterday to protest a new constitution which critics say increases the power of the government over previously independent institutions, ranging from the church and media to the courts and even the central bank. Russian police arrested at least 60 people in the capital of Moscow on Saturday during anti-government protests. Thousands of protesters converged on a train station in central China, angered over collapsing illegal investment schemes that residents said the government had failed to staunch. As part of an action called Occupy the Caucus, 12 protesters, including a 14-year-old girl, were arrested for blocking the doors to the Iowa Democratic Party headquarters on Thursday. Eighteen more arrests followed on Saturday and one on Sunday. A dozen anti-Wall Street protesters who had taken over a foreclosed home in Oakland to house formerly homeless individuals were arrested on Thursday. More than a dozen Muslim community leaders boycotted an interfaith breakfast organized by Mayor Michael Bloomberg on Friday to protest reported police surveillance of Muslim areas since the September 11, 2001 attacks. Large crowds of Yemenis rallied in major cities Sunday, demanding the outgoing president be put on trial for the deaths of protesters. Dozens of activists against gender segregation boarded buses serving Jerusalem’s ultra-Orthodox Jews on Sunday to protest the unwritten rule that women sit at the back. Thousands of angry Shia protesters staged a sit-in outside the Sindh Governor House in Karachi, Pakistan on Sunday night to protest the targeted assassination of their community leader.